Of late in monetary blog-land has been bruiting about central bank helicopter drops, usually defined as a last resort to boost aggregate demand and fight deflation. Traditionally, a helicopter drop has been the printing of paper money to aeronautically enrich a euphoric hoi-polloi. But now many monetarists consider digitized quantitative easing (QE) to finance or offset national fiscal deficits or tax cuts to be a chopper-toss as well. In other words, print money and finance government. But thinking it over, QE is always a helicopter drop. It just depends who gets the new money. Okay, in the years 2008 to 2014, the U.S. Treasury ran red ink and sold Treasury bonds, and the Fed digitized money and bought $3 trillion+ in Treasuries, through its QE programs. One does not have to be a cynic to conclude that the Fed printed money and gave it to the federal government, and Columbia economist Michael Woodford, sotto voce, pretty much says so. So, the institutions and people who sold Treasury bonds into the Fed’s QE program (through the middlemen primary dealers) received in exchange for their Treasuries digitized cash. They received a “helicopter drop” of money, but in exchange for their bonds (bonds that were somewhat appreciated by QE, btw). In this regard there is no moral hazard. Even today, no one really knows what people who sold Treasuries into the Fed QE program did with the $3 trillion+ in cash they got. We know the $3 trillion went into bank accounts, securities, property, cash or consumption, but by what fractions is unknown. There were property and equity recoveries during the Fed QE years. Some aver that conventional QE was a helicopter drop, but onto asset markets. But by another conceptual lens or viewpoint, even in the Fed’s conventional QE the taxpayers received a helicopter drop too. Federal taxes were relatively lower than otherwise during QE, as federal government operations were financed by Fed money printing and buying of Treasuries. Net, the federal government stopped borrowing money, or taxing enough to finance operations, and used Fed-created money. QE is always a helicopter drop. Westerners love to hazard guesses on China and that is what they are, guesses. Even a Mandarin speaker in Hong Kong (with whom I recently conversed), with family on the mainland and employed at a large private-equity fund, professes no special insights into opaque China. But China’s central bank, The People’s Bank of China, appears to have eschewed the advice of Western central bankers, and gunned the money presses this summer. Moreover, the PBoC tactic looks to be working. Readers may recall the situation faced by China in the warm season. The buzz was “hot money” was fleeing the Sino state, and PBoC had to raise interest rates to keep trillions of dollars from vamoosing back to developed nations. Without that hot money, China corporations would be starved for capital, their debt payments would soar, many bank loans would sour, and the Sino domestic economy would shrink. In 2015 the PBoC has cut interest rates five times, from 5.60% to 4.35%, the last cut in October. More cuts are forthcoming, suggest officials. The PBoC has unpegged the yuan, letting it sink within a daily band. The PBoC has cut bank reserve requirements three times in 2015. The PBoC has long engaged in QE, often by printing money and buying bonds from states, which used the money to build infrastructure. The PBoC may be upping its QE, but this is unclear. After a summer swoon, China’s stock market has stabilized, even rallied a little. The Shanghai Stock Exchange Composite Index, as of Dec. 24, is up 22.4% YOY. China retail sales rose 11.2% YOY in November, the highest monthly growth rate of the year. Also notable, as reported by the AFB, a “Chinese boom in air travel defies slowing economic growth” and China Southern Airlines in December ordered $10 billion of jetliners from Boeing, and then another $2.3 billion from Airbus. Two cruise ship lines, Norwegian and Carnival, have each recently announced they will build special liners based in China, at about a cost of about $500 million to $1 billion each in price. The China consumer-price index rose 1.5% in November YOY, reported the National Bureau of Statistics. As observers have seen globally for the last several years, central bank stimulus and QE appear to work, but do not result in much inflation, and so it is in China. The PBoC is below its 3.5% IT, and so has lots of room to run. Interestingly, The Economist has reported that the PBoC has been conducting QE operations for decades, through the nation’s period of rapid growth. The PBoC may have been curtailing QE in recent years, coincident or causative with slowing Sino growth (although slow in China is a 7% YOY GDP increase). There are reasonable concerns about state agencies allocating capital, not free markets (although who allocates capital to infrastructure anyway?). Nevertheless, the macroeconomic results of QE appear beneficial. Far East central bankers, at least in Tokyo and Beijing, are eschewing the tight-money totems of Western central bankers, and turning to growth policies instead. The growth strategies are working. Inflation remains muted. Indeed, after 30 years of rapid growth and QE in China, they are paying the price…um, that is, 1.5% inflation. PS. China remains backwardly barbaric regarding political and civil rights. Evidently, both “China’s Carl Icahn” (Xu Xiang) and “China’s Buffett” (Guo Guangchang) are in detention or under restrictions by Sino myrmidons. Even novelists dare not write what they want, let alone political activists. Should China implode, it will be from insensate official political stupidity, not economic policies. BNY Mellon Suggests A Brighter Future—And Why Not? Because of the Fed and Anti-Business Cranks? Of the many lamentable aspects of modern macroeconomics is the cowardly defeatism, that only slow growth is possible, and if not that, then advisable. So welcome is a recent white paper issued by banker BNY Mellon, which ponders a future in which the U.S., China, Japan, and India (the “G4”) come close to fulfilling economic growth potential—and not through heroics, but just by rising to past growth trends. The return to mediocre G4 growth would add $10 trillion to their projected GDPs by 2020, and another $8 trillion in related growth outside those four nations. I have agonized in this space a few times how long the “right-wing” or business class would abjectly genuflect to gold and tight money. This self-destructive monetary peevishness must certainly appeal only to ideologues, theoretical academics, pundits and traders who have shorted markets—and to no one in the real business world. I have found in interviews with economists in institutional real estate circles that the worship of tight money is absent. And now banker BNY Mellon says that the Bank of Japan’s aggressive QE program is a good thing. How long until the tight-money fanatics are seen for what they are: anti-business cranks. 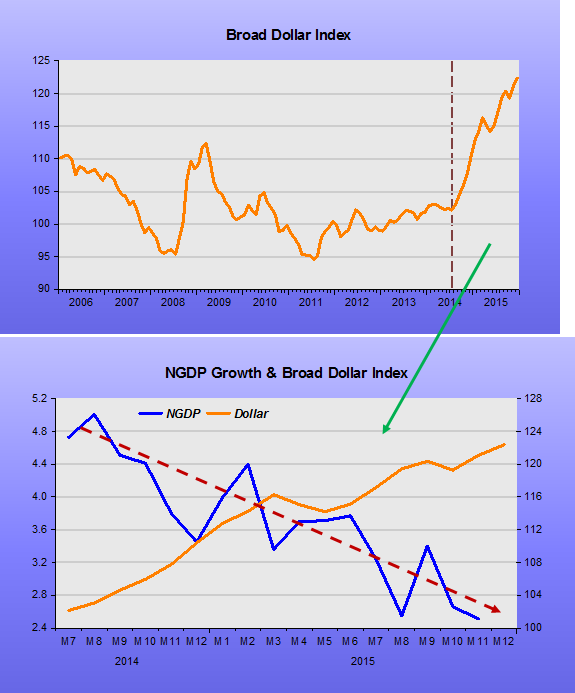 The Fed Is The Monkey Wrench? So, we read that the People’s Bank of China has been practicing a type of QE all along and is now lowering rates and considering more QE, and of course the Bank of Japan is in the QE camp. After foot-dragging and destroying the economies of a few nations, the ECB is in QE too. That leaves the Fed, which has quit QE and blindly painted itself into a corner by endlessly rhapsodizing about raising rates. So now a Fed return to QE would look like a “flip-flop” or institutional ineptitude or uncertainty. Would you like another $18 trillion in global GDP? Tell the ECB, the PBoC and the BoJ to pour it on, to go to QE hard and heavy, print way more money. But mostly tell the Fed.